This Friday, March 2nd, from 4 to 5 p.m. ET, I’ll be talking about Inbound Marketing on the LinkedIn Lady Show on RockStarRadioNetwork.com. This opportunity to chat live with Carol McManus, aka America’s LinkedIn Lady, and then have the show available for download on iTunes got me thinking about how radio has developed as an online marketing communications and PR medium. During the same timeframe, Marshall McLuhan published his mind-bending, ground-breaking book Understanding Media: The Extensions of Man. McLuhan described radio as, ‘The Tribal Drum.’ No wonder it’s translated so brilliantly to the Internet, where we’re all connecting with our online tribes. Radio used to be very local. It still is, but it’s also global now. If you get the opportunity to be interviewed on anyone’s local radio show grab it, even if you market nationally or internationally. Not long ago, I was a guest on a show aired by a tiny station in Westchester County, NY. Its signal may not reach more than a mile. But my mother listened in on her computer from Pennsylvania. Many shows are recorded and available to download and share, which really leverages the time you invest in preparation and the show itself. Even if the interview invites aren’t rolling in, you can still take advantage of online radio. You can create and promote your own radio show for free on BlogTalkRadio.com. BTR is the world’s largest social radio network. It just ranked #3730 in the three-month Alexa traffic rankings. More than 45,000 websites link to BlogTalkRadio. In essence, it’s the Wordpress of radio. There are several premium packages available that, among other features, include promotional impressions of your show to help you build audience. One of my clients, psychotherapist Dr. Annie Abram has created quite a successful show on BTR, Ask Dr. Annie. Once a week she interviews well-known authorities and authors in her field. Such a show builds thought leadership and credibility in and beyond your service area, and opens doors to collaboration, speaking engagements and other opportunities. It also gets her in front of her mailing list weekly when she promos the current week’s topic and guest. RockStarRadioNetwork.com – home of the LinkedIn Lady Show – was launched in November of 2011, by Craig Duswalt, former personal manager for Axl Rose of Guns N’ Roses, and currently a speaker, author and creator of the RockStar System For Success, and the popular RockStar Marketing BootCamps. The RockStar Radio Network is a talk radio production company whose brick and mortar studio is based in Tyler, Texas where the company’s full production staff works to create customized interfaces, live commercials and CD quality sound for all its talk radio hosts. Carol McManus built a national audience with a previous show that live-streamed on a local AM station in Greenwich, Conn., leading to an invitation to host her current show. Takeaway: Put radio into your online marketing mix. Call to your tribe and they will gather to listen! To shift gears to another form of social media, learn how you can make effective use of Facebook and Twitter. It’s all in our new White Paper available for free download via the button. 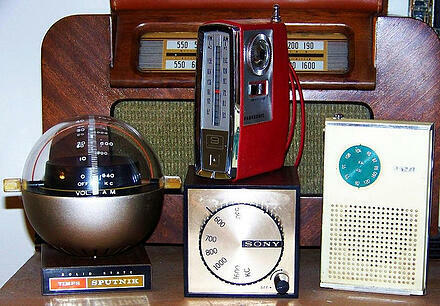 The image of vintage radios is from the Flickr photostream of AlexKerhead under Creative Commons license.